An international jury awards the Leica Oskar Barnack Award to professional photographers whose unerring powers of observation capture and express the relationship between man and the environment in the most graphic form in a sequence of a minimum of 10 up to a maximum of 12 images. Entry submissions must be a self-contained series of images in which the photographer perceives and documents the interaction between man and the environment with acute vision and contemporary visual style – creative, groundbreaking and unintrusive. Only one entry per photographer is accepted. 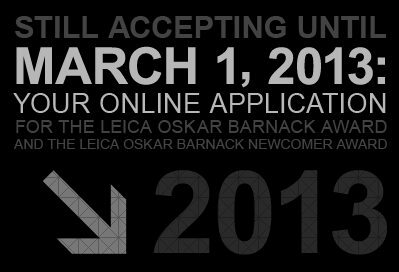 The winner of the “Leica Oskar Barnack Award” receives a Leica M camera and a lens worth 10.000 Euros in addition to a cash prize of 5,000 Euros. Image requirements: 72dpi in JPG format in the RGB color space; 1200 px high; up to 3 Mb in file size.